Weinfeld Skull Cap Manufacturing Co.
Buy direct from the manufacturer. 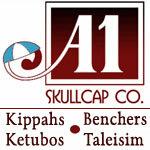 Buy yarmulkes (kipot, kippahs) and benchers (grace after meals) with personalized, gold stamping for your Bar Mitzvah, Bat Mitzvah, Wedding and other special Jewish occasion. With over 50 years in the business, we have the largest selection and the best prices. 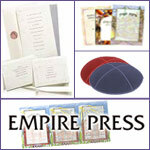 For all your priniting needs - graceful invitations, imprinted benchers and yarmulkes - Empire Press is your printer of choice for quality, selection, and service. 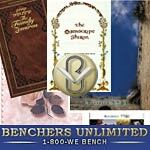 Largest selection of Nusach Ari benchers availble. Wedding Judaica center of Brooklyn. 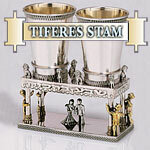 Tiferes Stam and Judaica is your one-stop-shop for all your wedding judaica. Bringing you the most unique collections of Ketubbot, Silver Kiddush cups, Mezuzot, gifts and more from all over the world. 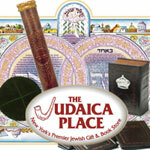 For ceremonial items for an upcoming holiday or event, or a gift for someone special, this store has an unparalleled selection of Judaica and gift items. From music to books, talleisim to mezuzahs, jewelry to art, souvenirs to silver. 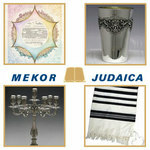 Visit their simcha center for all your wedding judaica needs where they offer a large selection of ketubahs,talleisim, benchers, yarmulkas and so much more. BirkatChaverim.com offers the Bnei Akiva bencher with full color and other cover options. Each order provides funds to local Bnei Akiva projects. 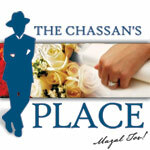 Custom logos, invitations, ketubbot and Judaica designs. 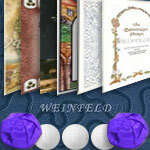 Eichler's has been a trusted source for Judaica since 1976. While our website was designed for ease of use, our dedicated staff is available to assist you. 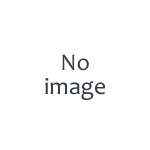 We carry thousands of products that are ready to ship immediately. Plus, our online prices are steeply discounted at low everyday prices.